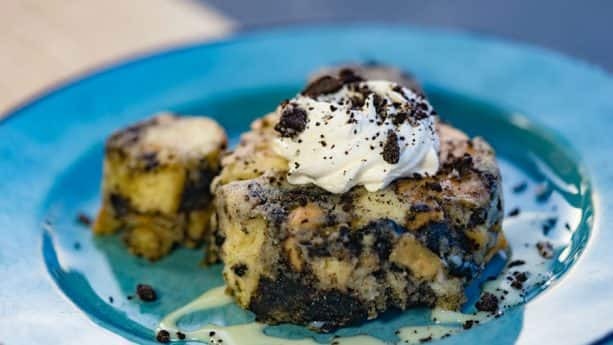 I absolutely LOVE anything cookies and cream, so when I heard that our chefs tested a recipe for the Cookies ‘n Cream Bread Pudding at Disney California Adventure park, I couldn’t resist sharing it! This special dessert is currently being offered at Pacific Wharf Café for Get Your Ears On – A Mickey and Minnie Celebration at Disneyland Resort. It’s the perfect sweet ending to any meal, and I know I’ll be making it tonight! And if you want to make this bread pudding yourself, see below for the recipe! Preheat oven to 350°F. Spray 9×13-inch baking pan with nonstick cooking spray. Set aside. Cut bread into one-inch cubes and place in large mixing bowl. Set aside. Combine eggs, sugar, half and half, and vanilla extract in a medium mixing bowl. Whisk until fluffy. Pour over cubed bread, stirring gently to mix. Set aside for 15 minutes and allow egg mixture to soak into bread. Gently stir in chocolate sandwich cookies. Pour bread pudding mixture into prepared baking pan and spread out evenly. Bake for 45-50 minutes, until top has set and a thermometer placed in the center reads 165°F. Whip heavy whipping cream in bowl of an electric mixer fitted with whisk attachment until medium peaks form. Cut bread pudding using Mickey Mouse-shaped cookie cutter and place on a plate. Drizzle with 1-2 teaspoons of sweetened condensed milk. Top each serving with 2 tablespoons whipped cream and 1 tablespoon of crushed chocolate sandwich cookies. Next articleSpecial Sneak Peek and Character Posters for Disney’s Dumbo Released!